Ship from Store (SFS) offers the capability to retailers to use physical stores as distribution centers. That helps you fulfill online orders from one or multiple sales channels, such as an ecommerce store, or multiple marketplaces. Go to Dashboard > Operation Dashboard or the Home Page when you log in. This view offers a summary of the SFS orders pending to be picked. Additionally, there is a link Go to ship from store page that allows you to go directly to the SFS page. Go to Sales > Ship from store page from the left menu. The list of shown stores can change depending on the User’s permissions. The SFS can be enabled (by default) or disabled at the source level in the configuration portal. If it is disabled, the source does not appear in this page, unless there are remaining pick lists still in progress. You can continue with the next step once you Generate Pick List with All Orders. The header shows the Store, the Pick List ID, and the status New. Furthermore, you will see all the Pick List details, such as: when it was created, Status, number of orders, and number of items. This list groups the items by Stock Keeping Unit (SKU) and does not take into account the order. The picking process can be done with a mobile device (tablet) using our In Store Interface where you will be able to confirm or decline the picking of a product. It can also be done by printing a pick list and then updating the interface based on final results. Confirm: you have found all the items in the store and want to confirm the total quantity of this product. The status of the Pick list will change to “Ready to Pack” when all products have been picked confirmed/ declined. Modify the Item Quantity: you have not found all the items in the store and you need to update the quantity of this product. A new panel will show the number of requested items and then, you must select the number of items to be confirmed and to be declined. You have to indicate the decline reason that could be: missing, damaged or hold. The list of reasons is configurable. Then, click update and the Pick List will be updated. Once you have the list of items updated and you have confirmed the quantity, click Start Packing. In case you have declined all the items, you have to click Confirm Selection. Select the store from where you want to continue working with a pick list and click Continue with pick list. Select the Pick List you want to Continue Picking and click Continue Picking. If there is only one pick list in progress, redirects you to the pick list view. Then, continue with the process as it was described previously. 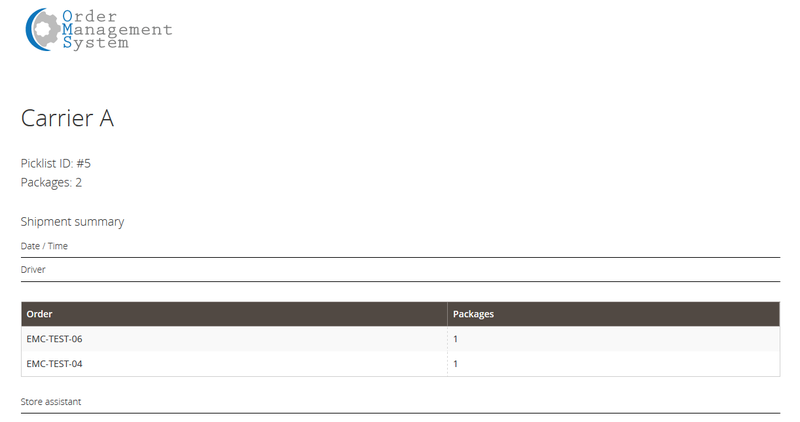 When you click Start Packing, a list of orders will be displayed for this specific Pick List. 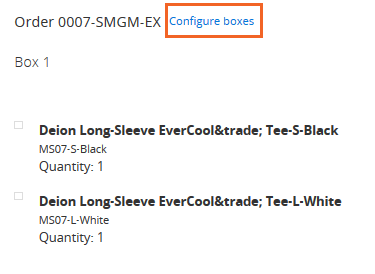 When there is an order with more than one product, you can configure the number of boxes you want to use. To do that, click Configure boxes. You can even create a new box by clicking the Add Box. Tracking Number: write the tracking number provided by the carrier. Tracking Link: this information can be automatically displayed based on configuration. This confirmation is per box. Once you confirm, you cannot change the carrier information. Select the Pick List you want to Continue Packing and click Continue Packing. Then, confirm order collected by carrier by clicking Confirm Shipping. You can always check the status and information of the Pick Lists that have been packed. Select the store from where you want to check the status of the different pick lists and click View Pick List.